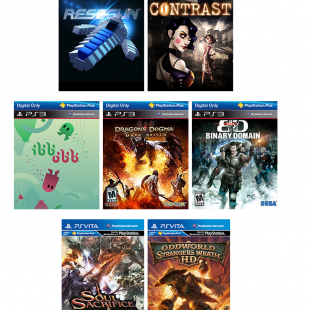 November will see PS Plus offerings across the Sony hardware spectrum including titles like Resogun, Dragon's Dogma: Dark Arisen and Soul Sacrifice. November is going to be a big month for Sony, with the obvious highlight being the November 15th launch of the PlayStation 4. Perhaps intent on making it just as big a month for its most dedicated customers, the company has unveiled four weeks of North American PS Plus offerings that include PS3 titles, Vita games and new releases for the PS4 itself. On the PS4 front, Plus members will be blessed with the gift of Resogun; a fast-paced side-scrolling shoot em' up from Housemarque, the studio behind the excellent Super Stardust series. Members will also be given access to Contrast, a nifty looking 2D/3D puzzle platformer made by Compulson Games. Outside of the PlayStation 4, November's PS Plus offerings are arguably just as good. PS3 owners will be privy to titles including the two player cooperative puzzler ibb & obb and the underrated third-person shooter Binary Domain, while RPG fans are in for a particular treat in the form of Dragon's Dogma: Dark Arisen. An improved version of Capcom's hit action-RPG Dragon's Dogma, Dark Arisen features a bevy of upgrades over the original game including new quests, weapons and a fast-travel system to enhance the experience. Vita owners can meanwhile look forward to Oddworld: Stranger's Wrath and Soul Sacrifice. All in all, November looks as though it will be a really good month for American PS Plus owners, further driving home how bonkers you are if you own a piece of Sony gaming hardware and haven't signed up for the service yet.